Ever since Disney first announced the New Fantasyland expansion for Walt Disney World’s Magic Kingdom, fans have wondered just when each phase of the biggest-ever addition to the theme park would open. While we recently shared a general timeline of the rollout of some the new attractions headed for the park, Disney has now released additional details for what’s coming soonest. In the Winter 2011 edition of the Mickey Monitor, the Walt Disney World annual passholder newsletter, Disney confirms that in early 2012, Storybook Circus will indeed be the first section of New Fantasyland to open, at least in part. As Imagineer Scott Mallwitz shared with me in August at the D23 Expo, a good portion of the Mickey’s Toontown Fair replacement will be ready early next year. Included among the attractions opening will be a new Casey Jr. water play area, the new version of Goofy’s Barnstormer roller coaster themed to “The Great Goofini,” and half of what will eventually become the “double Dumbo” attraction, offering two carousels of flying elephants as well as an interactive circus-themed queue. That latter part is the newest information, with only half of the new Dumbo attraction opening first, the second “twin” to follow “in the near future,” according to the publication. And it’s likely that when this new Dumbo opens in Storybook Circus in early 2012 (no specific date or month given), the existing classic Dumbo in Fantasyland will close permanently to make way for the new castle courtyard, new landscaping, and ultimately the Seven Dwarfs Mine Train Coaster in the general area. 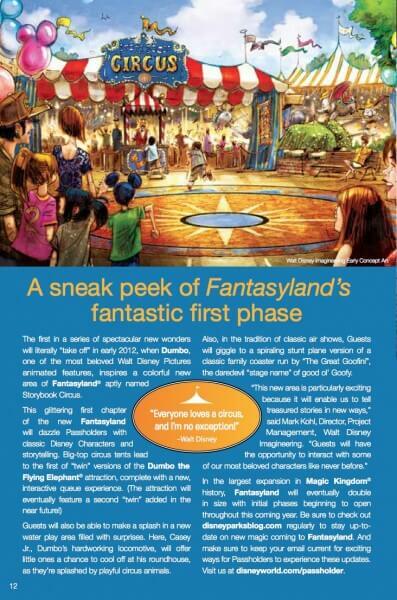 But Disney certainly wouldn’t leave the Magic Kingdom without a Dumbo attraction running, even during this massive expansion, so fans of the classic “right of passage” ride can look forward to enjoying the shiny new version, if only half of it, along with a few other parts of Storybook Circus beginning next year. I assume that WDW plans to relocate the existing Dumbo ride vehicles and other structural elements to the new location, after which both copies of the ride will be in operation. The vehicles and some pieces of the existing ride will likely form the second half, once moved over, but much will change in the specific look, design, and details of the attraction. I plan on riding both of the Dumbos. One in the morning and then one later in the day because when I spin on it it makes me dizzy. But I want to ride them both! I think the artwork is beautiful and I am thankful for the artists and the mechanical people who are building these rides so I can enjoy them. I hope you enjoy them too if you want.